1/4 cup warm water 110 F.
Melt 1 Tbsp. butter in a skillet over medium-low heat. Add jalapeno and cook, stirring until just softened, 3-4 minutes. Remove from heat and allow to cool. In a large bowl of the bowl of a stand mixer fitted with a kneading hook, combine the yeast and water. Stir and allow to stand 5 minutes. Add the buttermilk, the 3 Tbsp. melted and cooled butter and the egg and mix well. Add 2 cups of the all-purpose flour, the semolina (cornmeal), sugar and salt. Mix to combine. Begin adding addition all-purpose flour in small increments, until you have a smooth, moist (but not sticky) dough. Remove to the dough to a greased bowl, cover with plastic wrap and allow to rise until doubled, about 1 hour. Grease a 9x5-inch loaf pan and sprinkle with a bit of semolina flour or fine cornmeal. Set aside. Remove the dough to flour work surface. For a filled rolled loaf: roll dough in to a 8-inch x 16 to 18-inch rectangle. Scatter with grated cheddar cheese and cooled jalapeno. Starting with the short edge, roll up jelly-roll style. Place in to prepared 9x5-inch loaf pan. 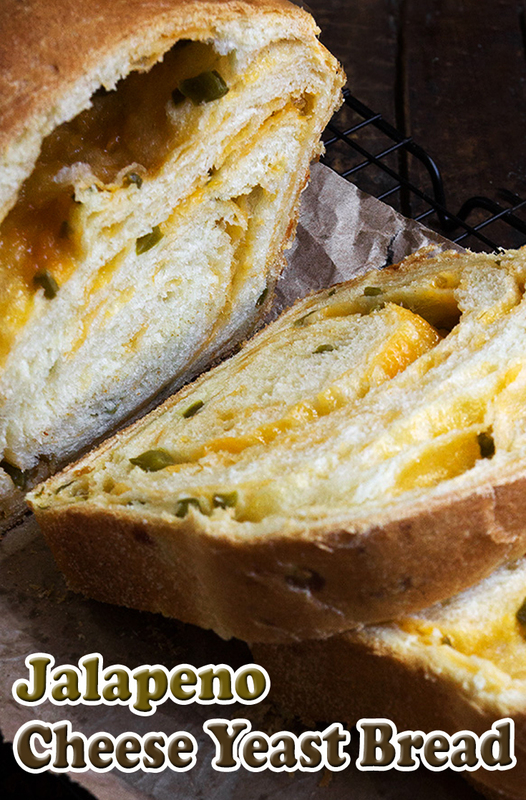 For a solid loaf, knead grated cheese and jalapeno in to dough. Form in to a rough 9x5-inch rectangle an place in to prepared pan. Cover loaf with greased plastic wrap and allow to rise until doubled, about 1 hour. *Check at the 45 minute point of cooking and cover loosely with aluminum foil if it is dark enough already. Preheat oven to 350 F. Remove plastic wrap. Sprinkle top with additional grated cheese, if desired. Bake in preheated oven until the top is deep golden and the bread sounds hollow when tapped on the bottom, about 1 hour. Cool in the pan for 10 minutes, then remove from pan and cool on a cooling rack.